After an anomalously warm day Saturday, cooler air returns for Sunday and that trend sticks around as everyone heads back to work Monday. Sunday, at least through the early afternoon, snow showers will continue in northern New England, especially along the spine of the Green Mountains of Vermont, a few reaching northern New Hampshire, while the snow showers that started in northern Maine and extended as far south as western Massachusetts finally fade. Highs Sunday will be at the start of our day, with afternoon temperatures sliding into the low to mid 40s south, and upper 20s to 30s north. A few inches of accumulation is possible into the higher terrain of Vermont and northern New Hampshire. After a cloudy start, most of southern New England will see plenty of sunshine for our Sunday with a cool NW wind. Sunday night, temperatures will continue to slide. Lows are expected in the lower 30s south and 20s north under partly cloudy skies with snow flurries in NW New England. Some of those snow flurries could linger into the early morning hours of Monday, but most of Monday will be dry as everyone returns backs to work after the extended holiday weekend. It will be a cool and quiet start to the work week with highs into the lower 40s south to upper 30s north. The cold weather is short-lived as another warm-up sweeps in. Highs by Wednesday reach into the lower 50s. That warmth also brings the potential for some scattered showers late Wednesday into early Thursday, but these will be few and far between. The next best chance for widespread rain doesn’t arrive until Friday and that threat continues into the first half of next weekend. 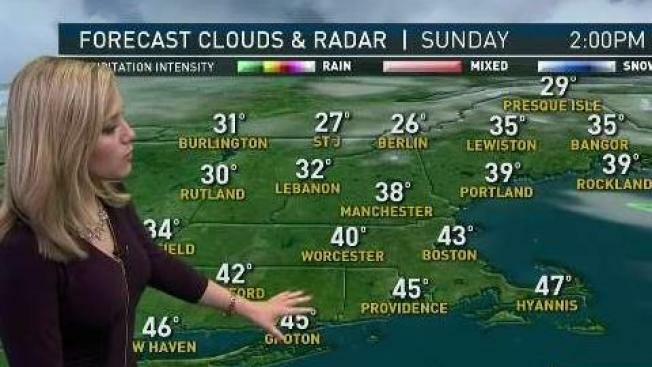 As always, during the busy holiday season, no matter where it takes you, be sure to take the NBC Boston / necn app with you on-the-go so you can stay up to date on the very latest weather forecasts.